Home health health news peeing Toilet useful Reasons Not to Flush the Toilet After Peeing. Reasons Not to Flush the Toilet After Peeing. Flushing the toilet after peeing is one of the way to keep the hygiene at high level. And of course, flushing should be done, but there are lots of people who are doing this non-stop. If you are one of them, you’ll find out that with every peeing and flushing you spend too much money on water and your water bill will be higher. Those money are practically flushed away money. It’s always a good idea to flush “number two,” but if it’s just pee? Instead of flushing the toilet non- stop, clean the bathroom in order to keep hygiene and avoid exposure to harmful substances. Flushing the toilet can cause spreading germs form the toilet bowl in the bathroom, so to avoid this you should constantly lower the lid and of course clean bathroom. Items for personal hygiene such as toothbrush, toothpaste, hairbrush etc. should be kept away from the toilet bowl. This is because the dirty particles can go into the brush and then you will put them in your mouth while brushing your teeth. Best way to keep your personal hygiene items is to keep them in a suitable container and far away from the toilet bowl. 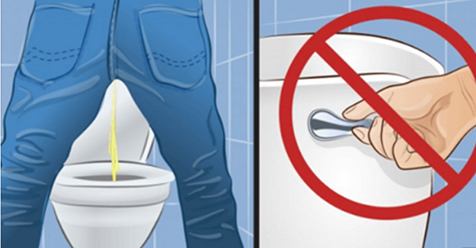 Here are some reasons why not to flush the toilet. Every one of us in some place goes to the bathroom to pee in the night. Just imagine a trip to the bathroom in the middle of the night. A single toilet flush can wake up the whole house.Flushing every time you pee (6-10 times a day) will waste 9 gallons of water.